Hello. Today is Sunday, that means it is exercise day! My husband and I have been going to the gym every Sunday for the last 5.5 years. We've only missed it one or two times (we even go when we are on vacation). I like going to the gym on Sunday because i feel less restricted in terms of how much time I can spend there. When I go during the week (usually Tuesday or Thursday), I feel more rushed since I've already had a long day, and I know I'd much rather be home. Only drawback of Sunday gym day is that it takes us a long time to motivate ourselves to go, so we usually don't get much else done that day. Today I decided to feature one of my favorite bars: Yottabar. It is a "granola" snack bar that apparently contains 1 serving of both my fruits and my vegetables, which makes me feel happy about eating it. It also doesn't contain anything "bad" like High Fructose Corn Syrup, something I try to avoid (pounds stay off longer when I avoid HFCS as well as other things like enriched wheat flour). My favorite flavor is cherry, followed quickly by orange. 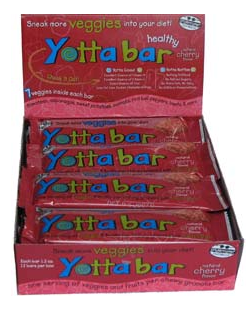 Yotta bars have about 120 calories, 1 gram of fat and 1 gram of fiber. They are 2 points on WW. I usually buy them at Whole Foods, you can also buy them from the Yummy Diet Food Amazon Store. You can also find the company that makes them "Undercover Vegetable Company" online as well. Enjoy! ooh-I haven't seen these. I am going to look for them this week when I go to Whole Foods. Thanks. I found them! I tried the cherry and it is yummy.